The Hurricane fighter was the backbone of the RAF Fighter Command during the Battle of Britain, and beyond. It first flew in November 1935 and was to replace the former biplanes. Of sturdy construction it was armed with eight machine guns, four packed tightly in each wing. This concentration of firepower made it the ideal killer of enemy bombers. However, the Hurricane's glory was always to be overshadowed by the more sleek and beautiful Spitfire. 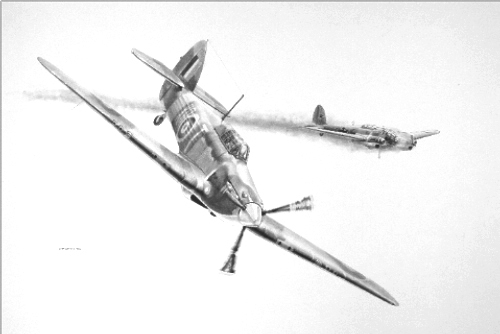 Little known to the general public was that more than half of the German aircraft lost during the Battle of Britain were shot down by the Hurricane.